Learn more about Union City, IN - Click HERE to go to the UnionCity-in.com website. There were 499 Pancake and Sausage meals served. Students from Mississinawa Valley and Union City High Schools assisted with the breakfast. The UCHS Football team and coaches helped move equipment in and out of the Elks Club. Special thanks to Mike Lumpkin of the Elks Club for helping to facilitate this event. 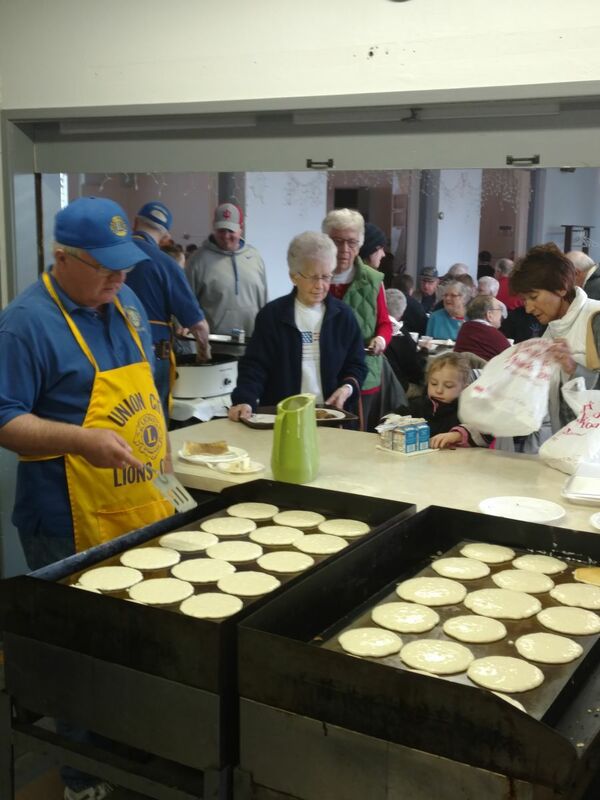 Fountain City Lions Club members worked with the UC Lions in preparation for a Fountain City Pancake Day next month. This is a picture of Lion Gary Miller making PERFECT Pancakes! The Union City Club met on Tuesday, March 26, 2019, at the Union City Community Room. The meeting started with a delicious meal of chicken and noodles / mashed potatoes prepared by D’s Restaurant. The program for the evening was presented by new Union City High School Varsity Football Coach, Keith Maloy. Keith’s football coaching started in 1996 when he was hired as an assistant coach in Union City. This will be his second stint as head coach of the Indians. When asked why he returned he said he sees it as an opportunity to be a part of the players' lives and to pour into their lives in a positive way. Keith was the youth pastor at the Wesley United Methodist Church in Union City and is currently the pastor at the Spartanburg Christian Church here in Randolph County. Keith wants to change the culture in athletics at Union City. 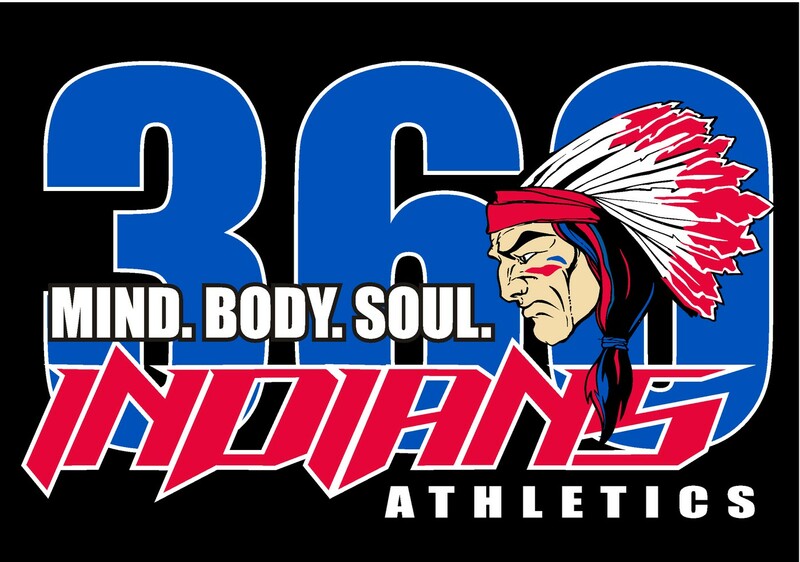 The program he will be using is called Indians 360 and focuses on the mind, body, and soul of each athlete. He wants his athletes to be able to contribute to society in a positive way when they leave school. We wish Keith and his team good luck this fall. 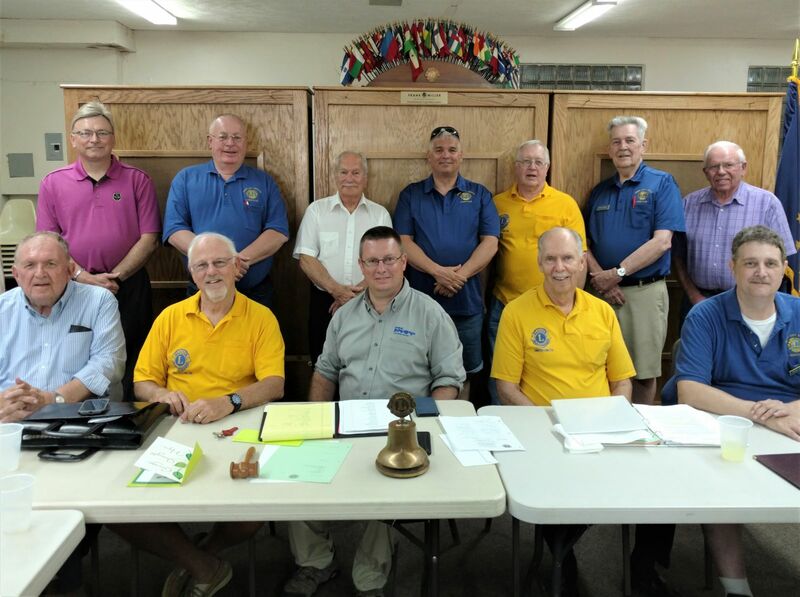 The Union City Lions held their regular meeting on Tuesday, March 12, 2019. The meal was again prepared by D’s Restaurant and was enjoyed by the 20 members and one guest attending the meeting. The program was presented by The Union City HS Science Olympiad Team. This year the team consisted of 12 students in grades 7-12 and they competed at the Butler University Science Olympiad Regional on February 23rd. The team is coached by RESC staff members Blake Clevenger and Kirk Schilling. Science Olympiad is a national competition where 15 member teams compete in 23 science related events. Some events involve building something and competing at the regional with it, some are study events where the students take a test over a topic, and some of the events are ones where students must prepare and then use equipment and materials at the event to compete. 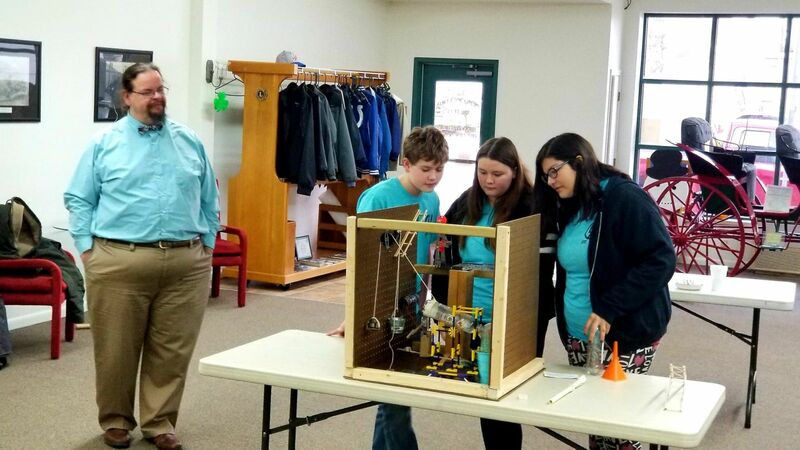 Our team competed against some much larger schools from Indianapolis, Bloomington, and other places in Indiana. The team did well bring home a couple of medals, and many memories of a very worthwhile experience. Blake and Kirk had three team members with them and they show the club some of the things that they built for the competition. The Union City Lions Club is the financial sponsor for this team and is very proud of it. Congratulations to the team and coaches for a job well done. Team members include David Bowers, Josiah Bowers, Kyle Buckingham, Kalam Denny, Sylaris Denny, Paula Gallegos. Antonio Jasso, Shelby King, Collin Perry, Hunter Reagan, Christina Sowinski, and Sullivan Thomas. Shelby King, Paula Gallegos, and Coach Kirk Schilling. 3/11/19 Blood Draw Gift Certificate Winner. The Union City Lions host a Blood Draw every eight weeks for the Community Blood Center of Dayton, Ohio. Melinda Frech is the Blood Center representative for Randolph County. Doug LeMaster is the Lions Blood Draw chairman. Darla Erwin, of the Randolph Nursing and Rehabilitation Center, furnished the Union City Lions Club Blood Draw with a gift card for Bouser’s Barn to be awarded to one lucky blood donor. In a drawing, Carrie Adams was the winner. gift card winner Carrie Adams. The Union City Lions Club met on Tuesday, February 26 for its regular meeting. The meal of ham and beans, cornbread, fried potatoes, and fruit, provided by D’s Restaurant, was enjoyed by the 19 members and two guests that were present. The program for the evening was Mr. Aaron Black. Mr. Black was recently named the new Superintendent of the Randolph Eastern School Corporation. Mr. Black grew up in Union City, attended UCCHS, and graduated in 2000. He graduated from Ball State University and started his education career at Monroe Central Schools. Since then he has been on the missions field in Haiti, was the Principal at Anderson Preparatory Academy, he was the Athletic Director/Assistant Principal here in Union City, and the Principal of Union City Junior/Senior High School. He told us that RESC is doing well. The school system has good working relationships with the community and the county, students can graduate from high school with 36 college credits, and students from Union City and the rest of Randolph County can be involved in programs like our Radio/TV program (KISS), Criminal Justice class, and Apache Design. Mr. Black feels it is important to tell our story as much as possible. He did say that one of the biggest challenges over the next few years will be finding quality employees. About 50% of the employees at RESC have 24 years of experience or more and who we hire to replace them when they leave is very important. Mr. Black's presentation was followed by a question and answer time with many topics covered. Thank you, Mr. Black, for a good program and we wish well as you lead RESC. 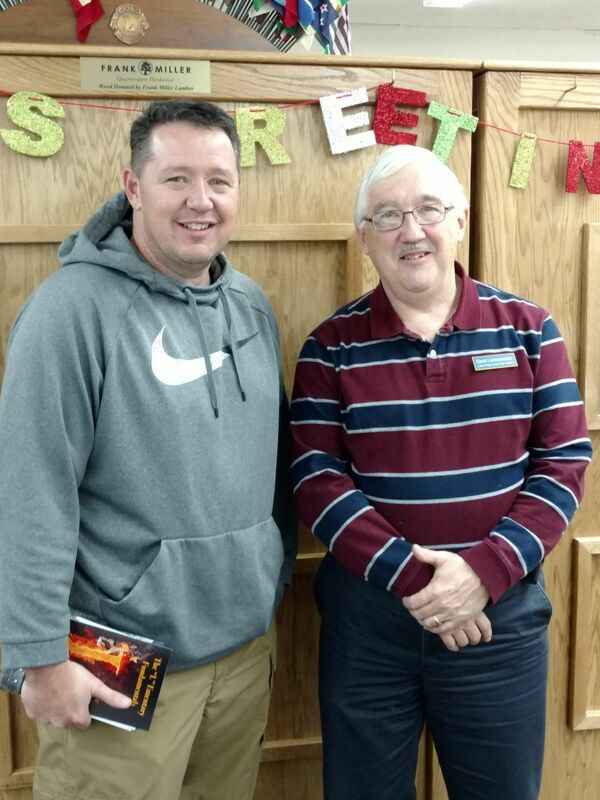 Pictured are RESC Superintendent Mr. Aaron Black and Lion Program Chairman, Jack Anderson. Also at our meeting . . .
Jan Aukerman shared information to the club about the Dancing For The Stars fundraiser planned for April 13th at 6:30. The event will be held at the Union City Jr/Sr High School and will be a tribute to our Veterans. The cost will be $10 and all of the proceeds will be given to the Union City Elks Club Cancer Fund. If you need more information about this fundraiser call 937-968-5911 or 765-964-5409. The Union City Lions Club held a regular meeting on Tuesday, Feb 12th in the UC Community Room in downtown Union City. Once again the meal was prepared by D's Restaurant in Union City. The program for the evening was presented by Jason Blunk. Jason is the president of the Richmond Civic Theatre in Richmond, Indiana. The RCT is completing it's 78th season this year. Mr. Blunk talked about the many activities at the theatre throughout the year and also gave away two sets of tickets to the Richmond Civic Theatre. Jason told us that the RCT puts on about 20 productions each year which this year included Sister Act and A Charlie Brown Christmas. Coming up in March will be a presentation of Young Frankenstein, in May it will be Leading Ladies, and looking forward to next season the musical Mamma Mia is in the plans. The RCT also has a Radio Theatre and a Youth Theatre. They also plan shows for school groups and had about 1,000 students visit the theater over the past year. The Richmond Civic Theatre is truly a gem in East Central Indiana from the beautiful facility to great productions for every interest and age group. For information about RCT, including scheduled performances, ticket prices, and memberships, go to http://www.gorct.org/ Thank you, Jason, for a great program. 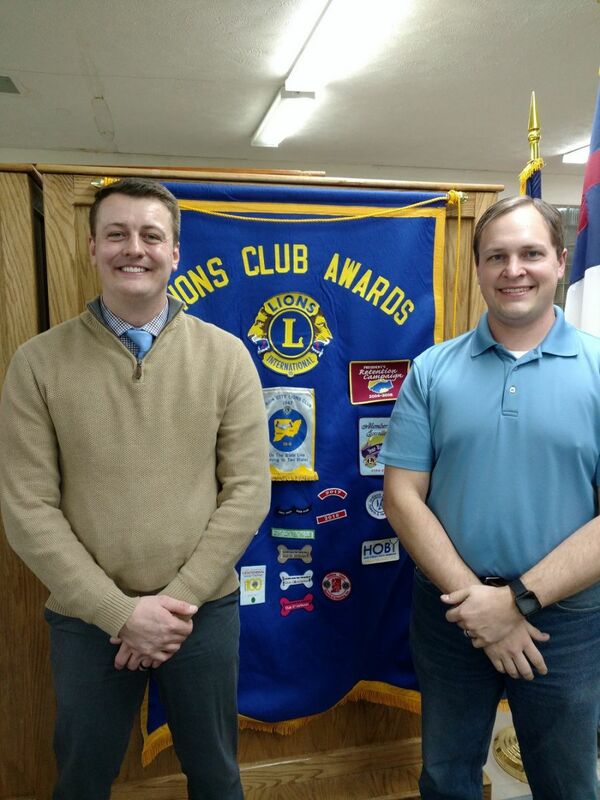 Pictured are Richmond Civic Theatre President, Jason Blunk and Union City Lion, Sam Davenport. 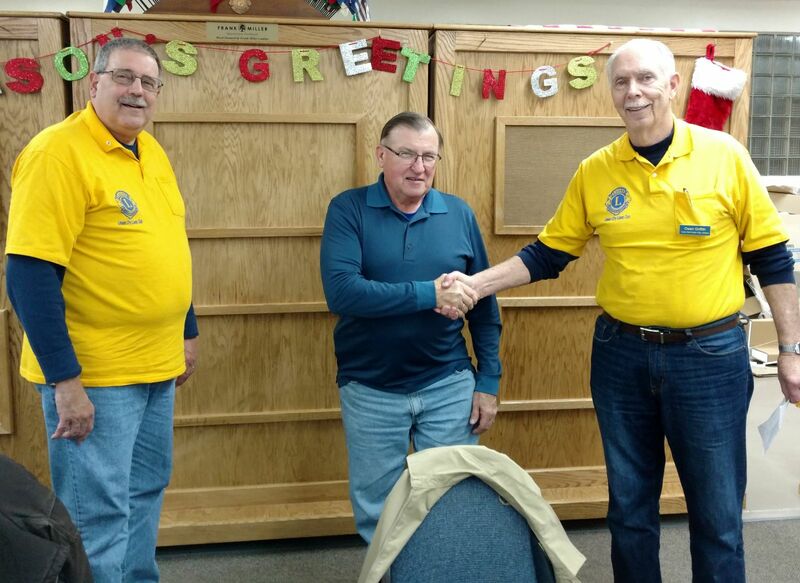 The Union City Lions Club had its second meeting for the month of January on Tuesday, January 22, 2019. The club enjoyed the meal prepared by D's Restaurant of Salisbury steak, mashed potatoes and gravy, green beans, and mixed fruit. The program for the evening was North Side Elementary Assistant Principal, Mr. Andy Stover. Andy spoke about the character education program going on at the school called, Leader in Me. 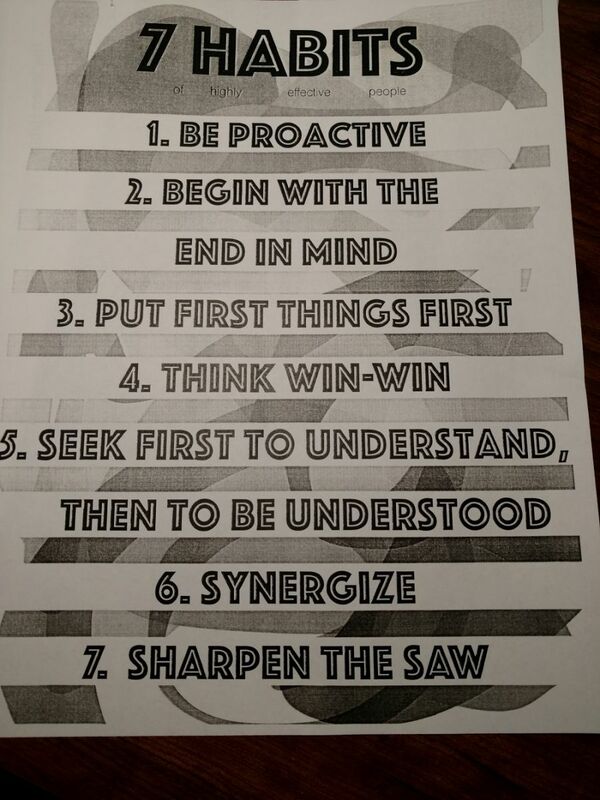 North Side was involved last year with a study of the book, "7 Habits of Highly Successful People" by Sean Covey. The staff and students studied the 7 habits through the school year last year. This year they have taken the next step and are involved in the Leader in Me program. The leader in Me uses the information from the 7 Habits book and teaches kids about good character traits. Andy emphasized how important character education is for our students in this day and age. Thanks, Andy for an informative program. 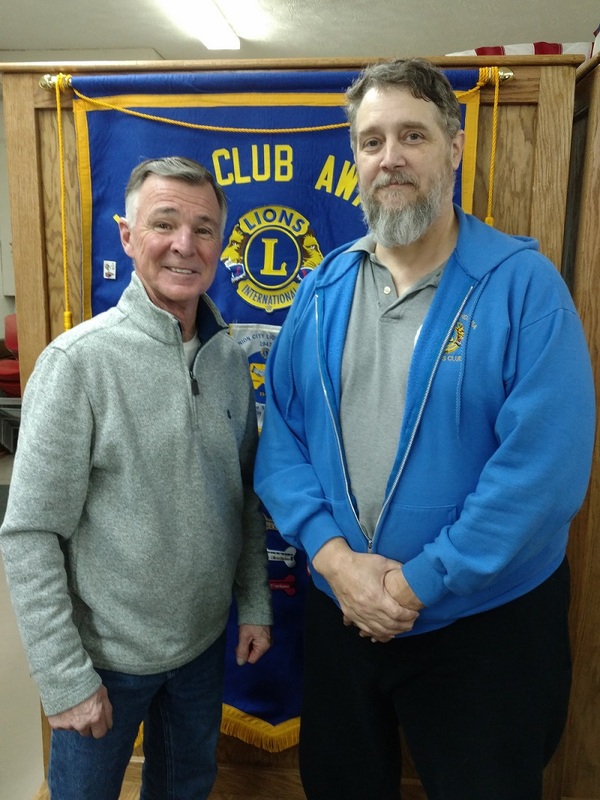 The Union City Lions Club started 2019 with their first January meeting. Once again the meal was provided by D's Restaurant. 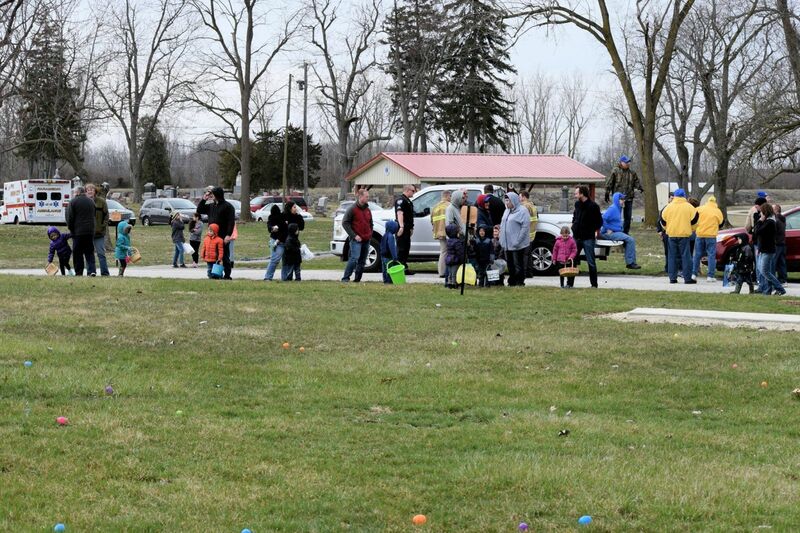 Our program was an update by Larry Amspaugh on the past Christmas Season's activities at Harter Park. A Community Christmas had a spectacular run in December with the Christmas lights at the park. Larry shared that A Community Christmas had a Facebook page that had 37,000 hits. From Thanksgiving until Christmas night there were 5474 cars that drove through the park and $18,314.62 in donations was collected. WOW! Organizations that manned the gates kept 25% of the gate receipts each night. The two nights the Union City Lions worked the gates there were 782 cars and our 25% was $681. Thanks to a Community Christmas for supporting organizations in Union City. Larry also shared that the light display in the park brings people from all around during December. On one night (Dec. 15th) there were people who came through the park from over 30 communities around Union City. Lights and Flights (airplane rides from the airport in Winchester over Harter Park and back) had a great year also. A fundraiser for PAWS in Union City, there were 139 flights with three people/flight. We would like to thank Larry, Chad Spence, and all the volunteers that make this possible each year. 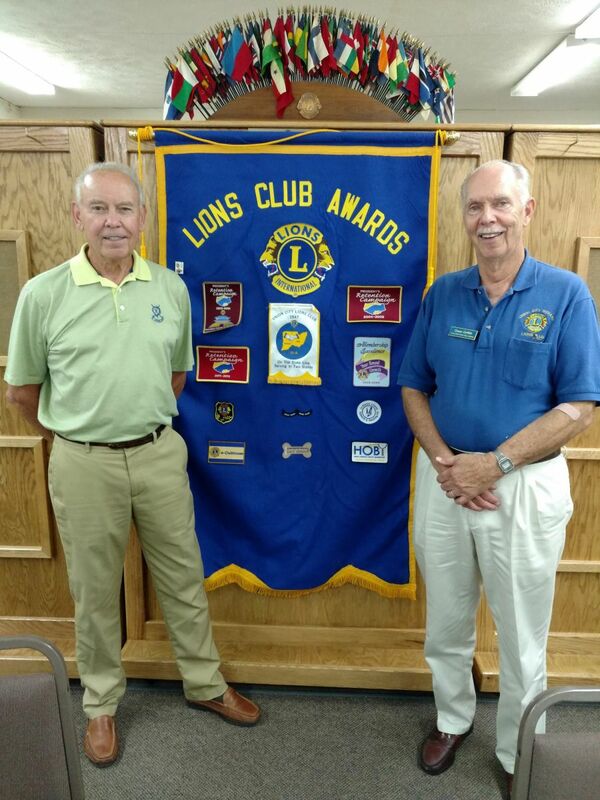 Pictured are Lion Larry Amspaugh and program chairman, Lion Ed Speight. 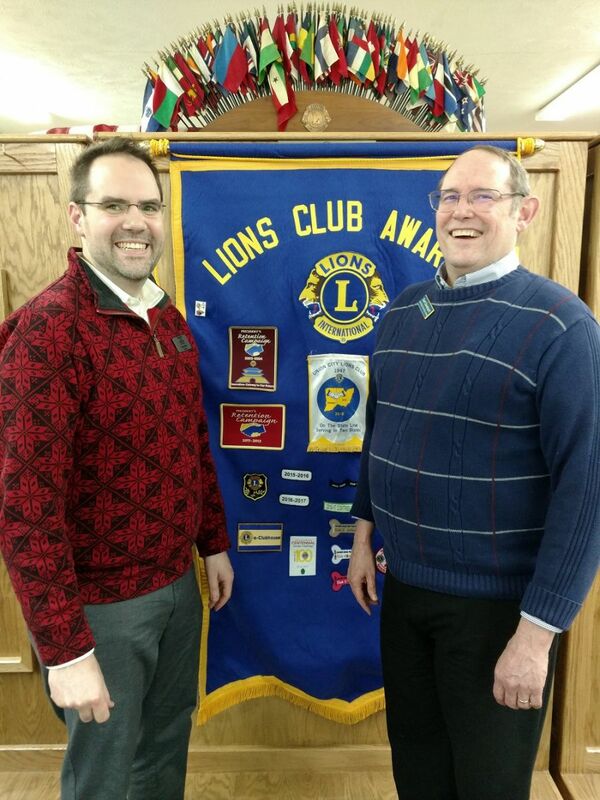 Pictured are Pastor Geoff Grow and Lions program chairman, David Lenkensdofer. 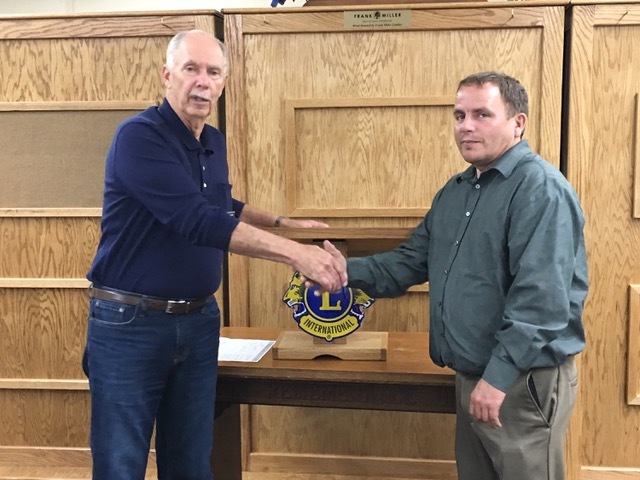 Congratulations to the newest Union City Lion, Len Hindsley. Len was inducted into the club on Tuesday evening. Len was sponsored by Lion Kevin Lehman. 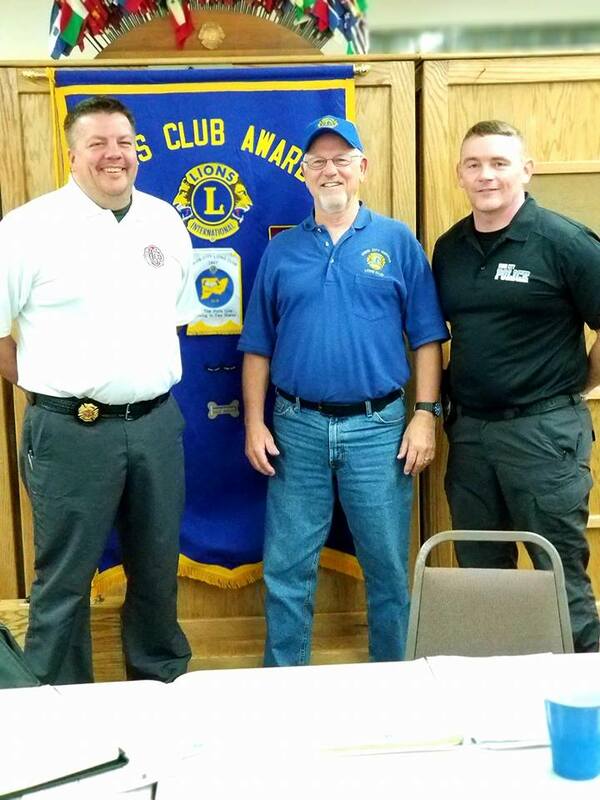 Pictured are Lion Kevin Lehman, new Lion member Len Hindsley, and Lions Secretary, Owen Griffith. The Union City Lions Club held its 1st meeting in November on Tuesday, November 13th. A meal, prepared by D's Restaurant, of meatloaf, mashed potatoes and gravy, corn, and fruit was enjoyed by the members and guest present. The program for the evening was presented by Penny Brunk, manager of Casey's General Store in Union City. Casey's has been open in Union City now for about 10 months. Penny told the club that the first Casey's was started in Boone, Iowa in a garage in 1968. Today Casey's has over 2,000 locations in 16 midwest states. Casey's is the 5th largest pizza chain in the US and the 4th largest convenience store chain in the US. Casey's in Union City is open 24 hrs/day and in addition to gasoline and regular convenience store items, it has a full kitchen and an extensive line of food items. Starting with donuts, made fresh between midnight and 4 AM every day, and a large selection of drinks and snacks, Casey's also has many types of pizza (very delicious pizza I might add) and sandwiches. The kitchen in Casey's of Union City is also open 24 hrs/day. The store also has ice cream and many types of coffee. Nationally, Casey's prides itself in its many partnerships in the communities they serve. The Union City Casey's partners with clubs, school events, athletic teams, groups doing fundraisers, and Casey's supplies coupons for schools and churches to give out as rewards for many different things. This past year Casey's celebrated 50 years in business. The Lions Club would like to thank Penny for a good program and wish Casey's of Union City the best in the future. The Union City Lion Club held its regular meeting on Tuesday, Oct. 23rd. The Lions in attendance listened to a presentation by Union City business owners, Jim and Diana Dubeansky. Jim and Diana are owners of Jim's Auto Detailing. Jim explained how the business got started and talked about the many services they offer. Jim's Auto Detailing offers Washes, Leather Treatments, Window Glaze, Paint Sealers, Tar removal, Carpet and Upholstery Extraction, Fabric Guard, Vehicle Pick up and delivery, as well as custom services. Jim's is located at 920 N. Plum Street and can be contacted at (260) 224-9178. Thanks for an informative program, Jim. Pictured are L-R: Ed Raszkowski (Program Chair), Jim and Diana Dubeansky. 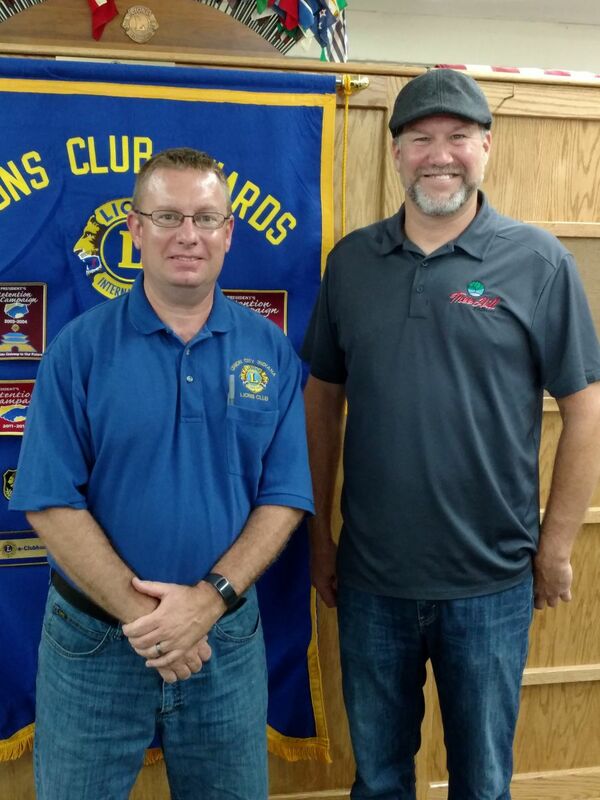 Pictured are Union City Lions Secretary Owen Griffith, and new Union City Lions Club member, Scott Reagan. 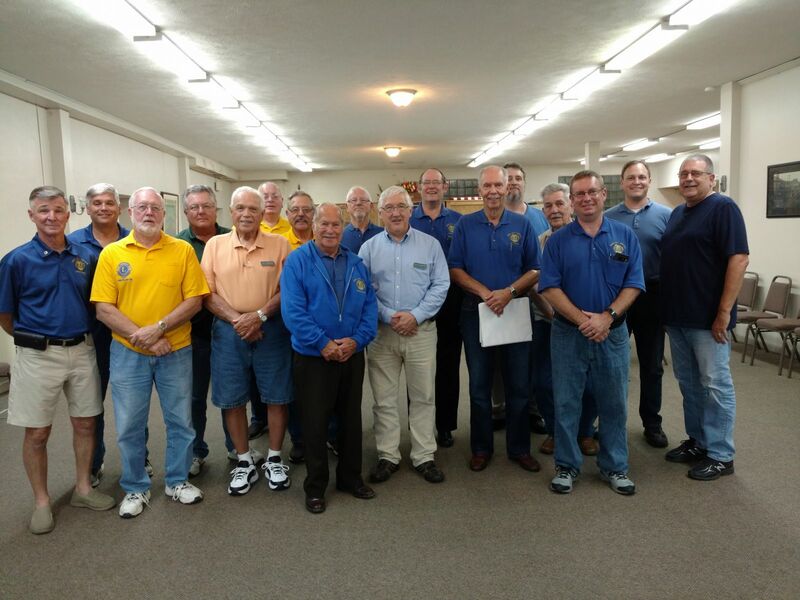 The Union City Lions held its 1st meeting for October at the Community Room in Union City, Indiana on Tuesday, October 9th. 23 members and 3 guests enjoyed a delicious meal of fried chicken, mashed potatoes and gravy, corn, and chocolate pudding. The program for the evening was presented by Errol Klem from Winchester, Indiana. 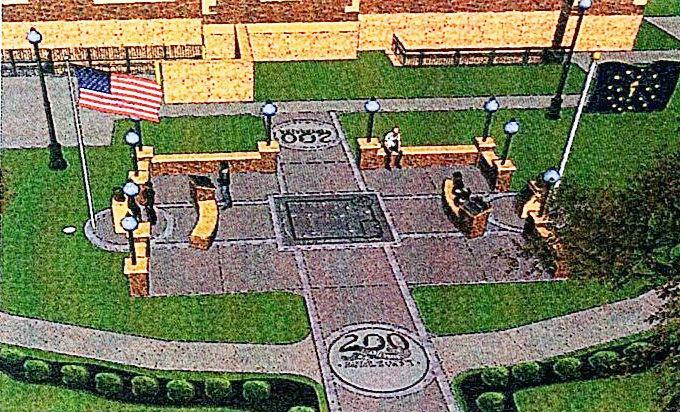 Errol spoke about the new Bicentennial Plaza on the south side of the Courthouse in Winchester. The idea of a "Gathering Place" was first brought forward in the summer of 2016. After much discussion and many meetings with community and county leaders, the idea finally started to become a reality. Many individuals were instrumental in coming up with the plan, the design, and the funding of this project. Scottie Harvey, our own Union City Lion Owen Griffith, Courthouse Architect Bob Taylor, Dustin Nealeigh (a Greenville HS Student), Dane Starbuck, Chris Talley, Mike Wickersham, and of course Errol Klem were all very helpful with this project. 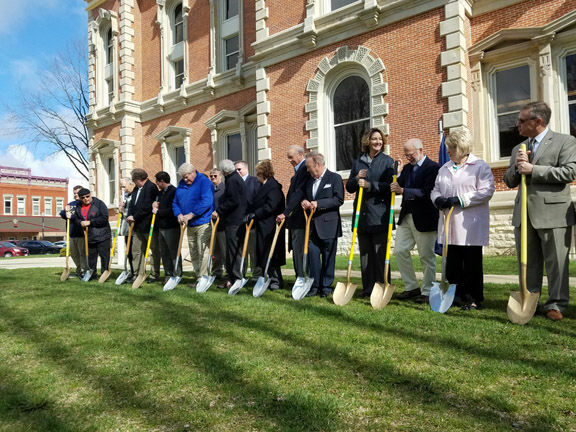 Groundbreaking for the plaza was in April and it was dedicated on Sunday, September 23, 2018. 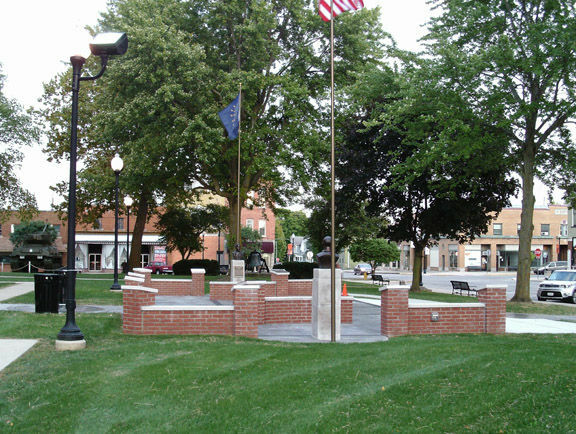 The Plaza contains many historical plaques fill with Randolph County history, a map of the county, and busts of the two Indiana Governors from Randolph County, Issac P. Gray from Union City, and James P Goodrich from Winchester. Thanks to Errol and the many people who worked on this project to make it a reality. 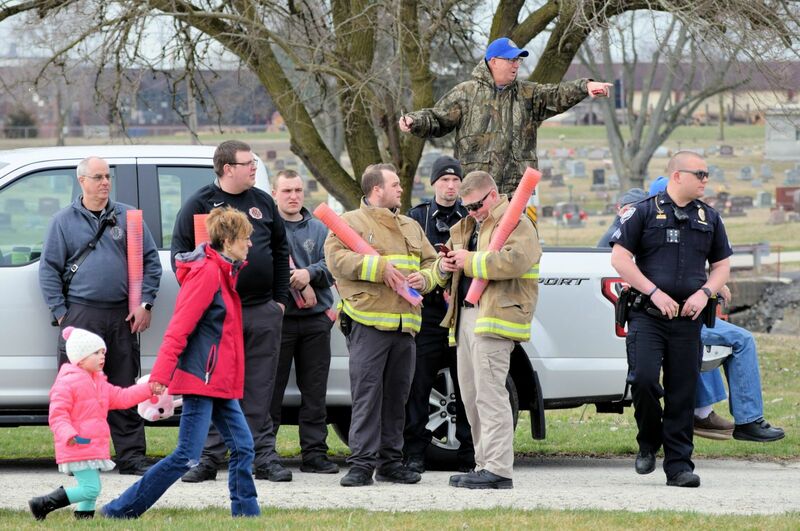 The pictures of the plaza included below are from the Internet with credit to the News-Gazette. The Bob Gard Golf Outing was held on September 29th at the Winchester Golf Club. It was a GREAT SUCCESS as 22 teams participated. The money raised was given to two organizations, The Journey Home in Winchester, and the Union city Lions Club. The Journey Home is a place were homeless Veterans can find temporary housing and help. Over $1300 was raised in the golf outing and donated to these two organizations. 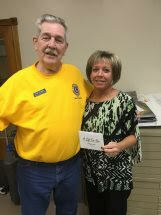 The Journey Home and the Union City Lions Club each received $667. Thank you to the individuals who organized this fundraiser and to the people who donated money and paid to play. At our meeting on Tuesday evening, we started with a delicious meal prepared by D's Restaurant in Union City. The members enjoyed chicken, mac and cheese, green beans, mixed fruit, and a roll. Among the items on the agenda for this meeting was to honor the club members who had perfect attendance last year. Pictured below are Union City Lions Club members who had perfect attendance during the 2017-18 Lions year. Thank you for your dedication to the Lions Club of Union City. 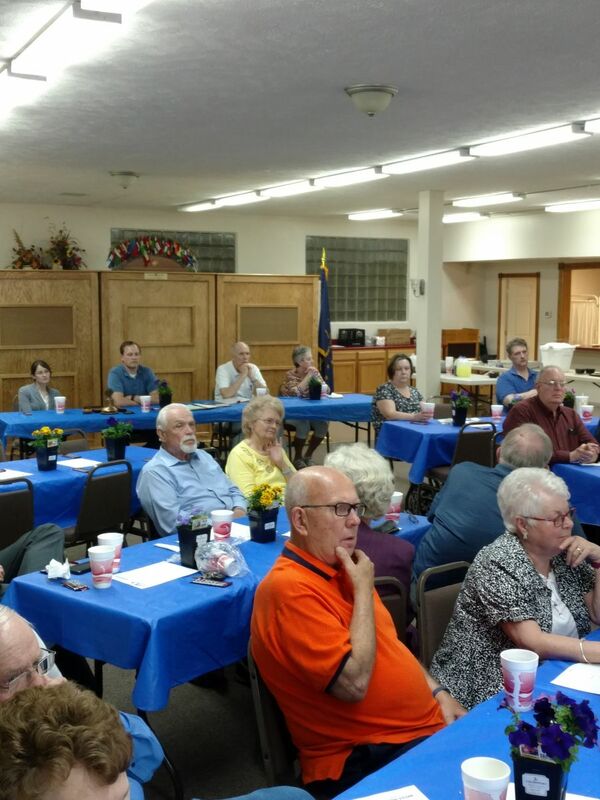 The Union City Lions Club held the first meeting of the 2018-19 Lions Year on Tuesday, Sept. 11. A delicious meal served by D's Restaurant here in Union City was enjoyed by the members and three guests. After the meal, Mike Grimm and Larry Carpenter shared some information about a golf scramble being held in honor of Bob Gard. Bob worked for 21 years at the Winchester Golf Club and was a Union City Lions Club member for many years. The golf outing will be at 1:00 on Saturday, September 29th, at the Winchester Golf Club. Proceeds from the outing will go to the Journey Home in Winchester and to the Union City Lions Club. The program for the evening was presented by Darby Livingston from Tree Hill Farms. 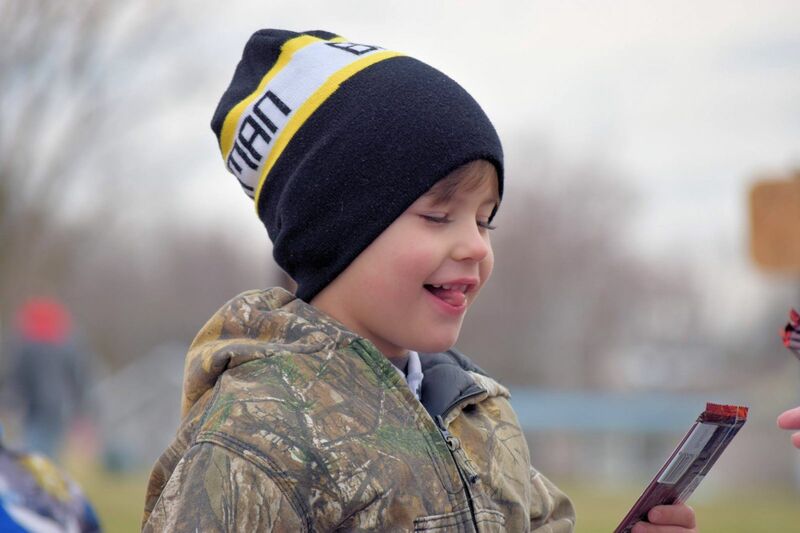 Darby along with his mother and brother are transforming the family grain farm into a farm that produces what Darby calls "Real Food." Tree Hill Farms produces vegetables and meats that are chemical, antibiotic, and hormone free. Their products include many types of produce and meats including pork, beef, chicken, even ducks, geese, and eggs. Tree Hill Farms want to become the local "one-stop shop for real food." The goal of Tree Hill is Real Food Made Simple. Darby told us that Tree Hill Farms has purchased the old Pit Stop Grill building in Union City. They want to use the facility as a kitchen to process their food and to hold farm to table events. They do not have plans to open it as a restaurant but would like to bring in guest chefs to prepare meals and to have teaching events that deal with food preparation. If you are interested in food from Tree Hill Farms the best way to access that is on their website. They have pick-up locations around the area and will deliver to your door for a $9.00 delivery charge. Their web address is https://treehillfarms.com/ Thank you, Darby, for a great program. 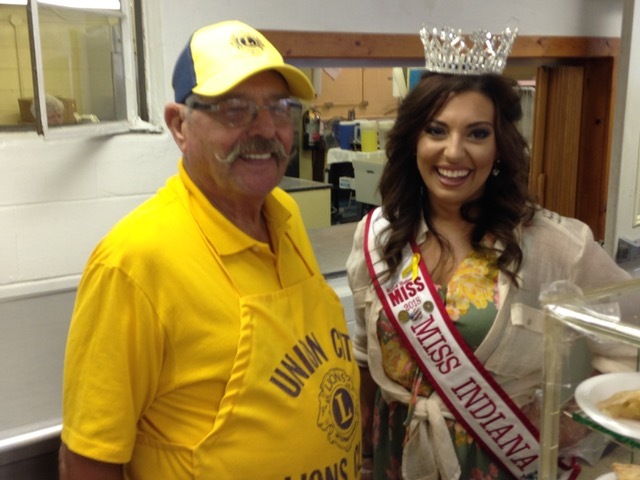 Pictured are Union City Lions Club President Joe Wyant and Darby Livingston from Tree Hill Farms in Union City, IN. The new Lions year will start this fall with our first board meeting in August, a Blood Draw on August 27th, and the first regular club meeting of the year on September 11th. See you then! If you are not a Lions member but would like to be one, contact any member for information and an invitation to a meeting. On the afternoon of August 4, a group of Union City Lions rode in the State Line Heritage Days parade. The Lions are proud to serve our community. The Union City Lions Club helped with the Extension Homemaker’s 4-H Food stand on Monday, July 23 at the Randolph County 4-H Fair. 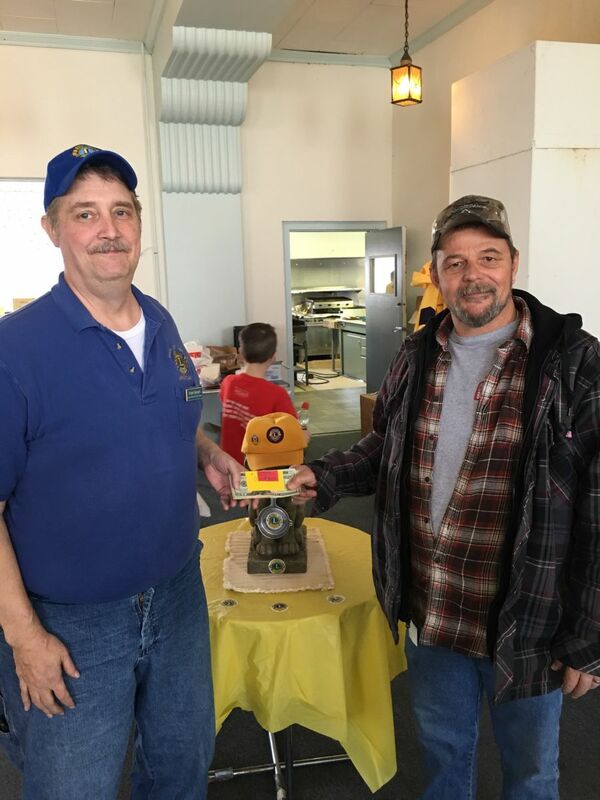 The Union City Lions have assisted for the past several years at the Lunch-Time shift. 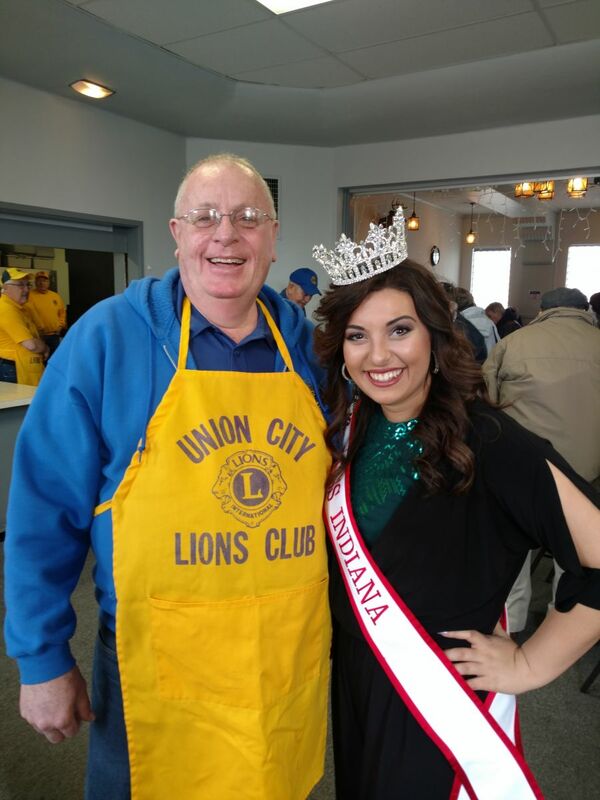 Pictured is Lion Jack Anderson with Miss Indiana Lyndsea Burke, who also worked at the Food Stand. Dale Stoner passed away on Sunday, July 8. He was 90 years old. There will be a gathering in his honor at the Community Room on Thursday 7/12/18 from 4:30 - 6:00. Dale joined the Lions in March of 1961; the records are incomplete but he did receive a 45-year Chevron in 2006. The Union City Lions Club prepared breakfast at the Randolph County Airport Fly-in Breakfast on Saturday, June 9th. It was a great way to serve the county and a good fundraiser for the club. Thanks to all helped. 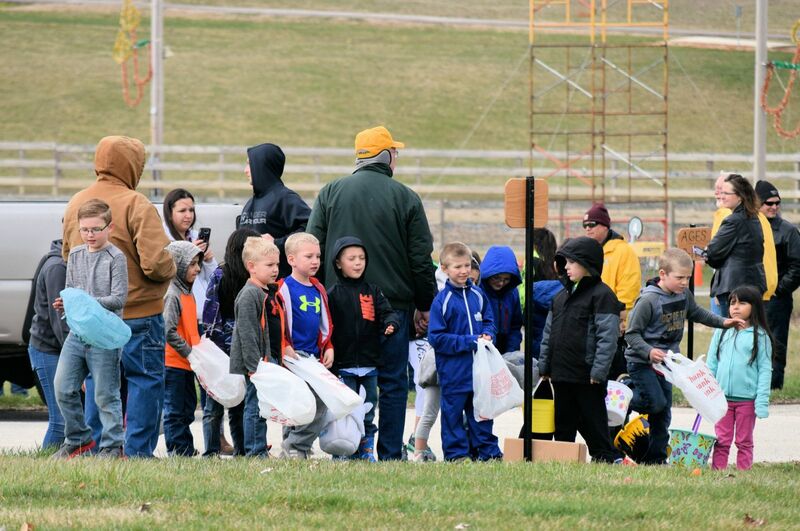 Other UC Lions Club events planned for this summer include serving in the food building at the Randolph County 4-H Fair on Monday, July 23rd, and participating in the Stateline Heritage Days Parade on Saturday, August 4th. See all of you back this fall. 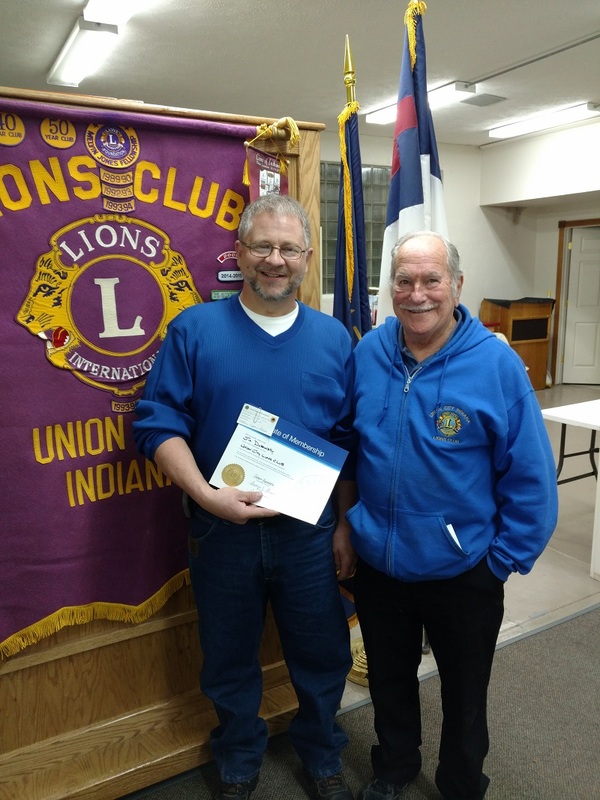 The Union City Lions Club was presented with a plaque for being a Leading the Way Platinum Partner for its participation in Blood Draws in our community. Lion President Blake Clevenger accepts the plaque from Blood Draw organizers Doug LeMaster and Harold (Hoddy) Speight. 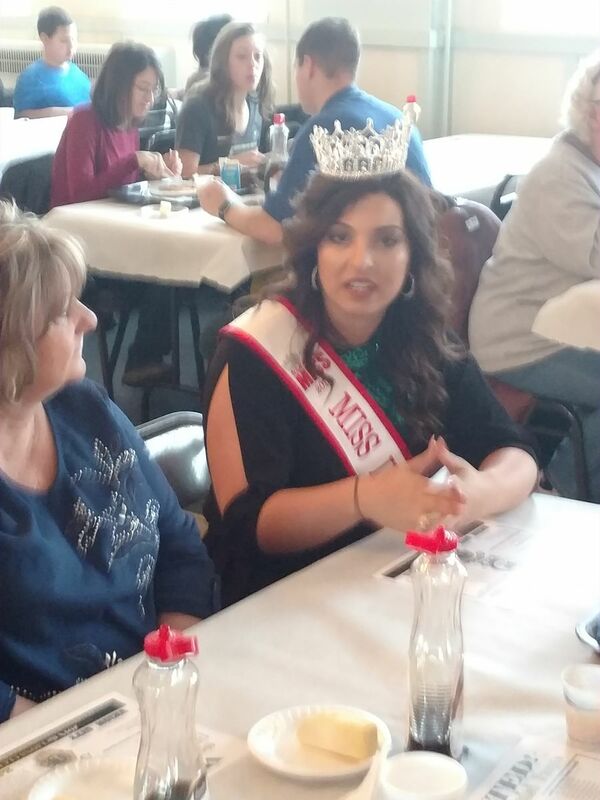 The Union City Lions held it's Spring Ladies Night on Tuesday, May 8th. 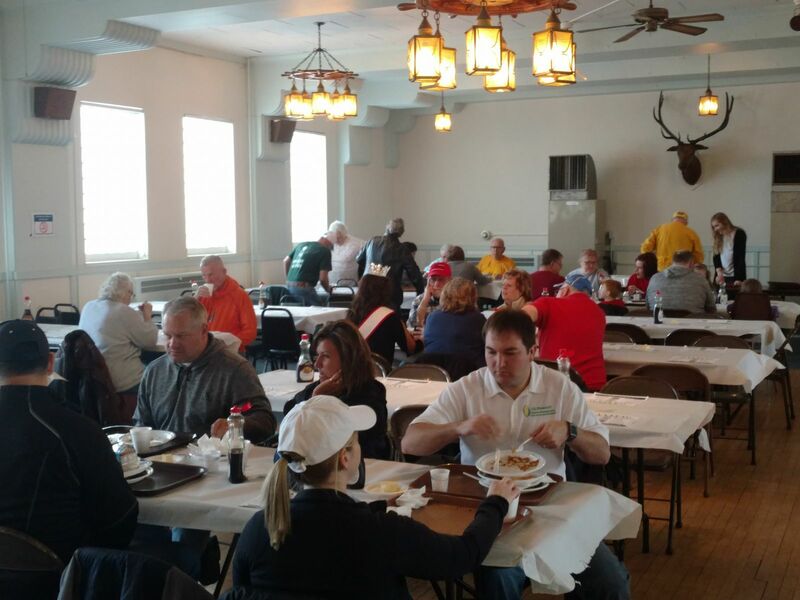 The Lions and their guests enjoyed a delicious meal prepared by Bouser's Barn. After dinner, the group was entertained by the Faithful Sons Quartet. 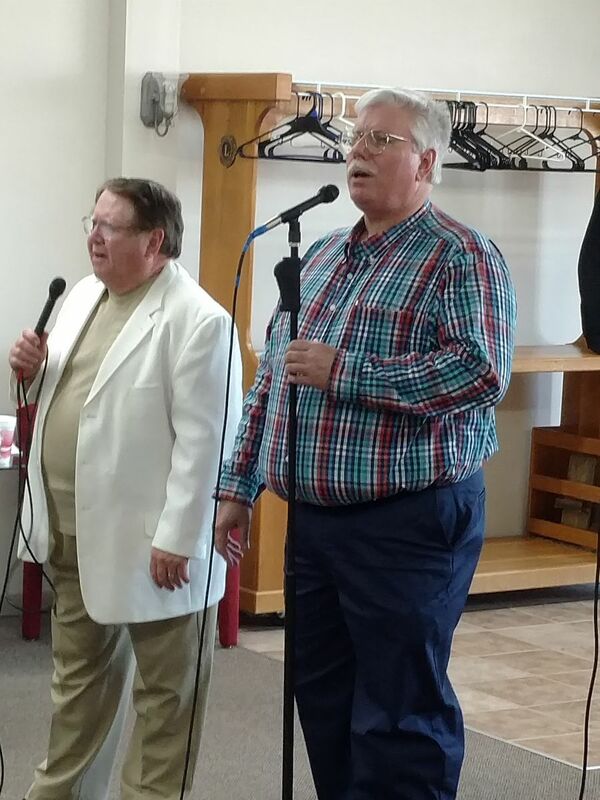 The four members of the quartet are John Short, John Sipe, Kent Waller, and Kim Gilbert. 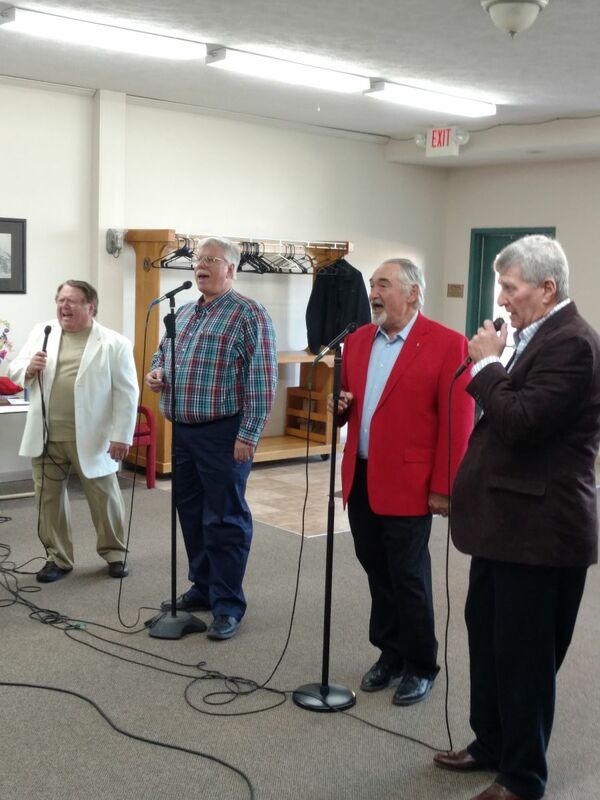 The quartet sang many Gospel songs for the group and the evening was enjoyed by all. 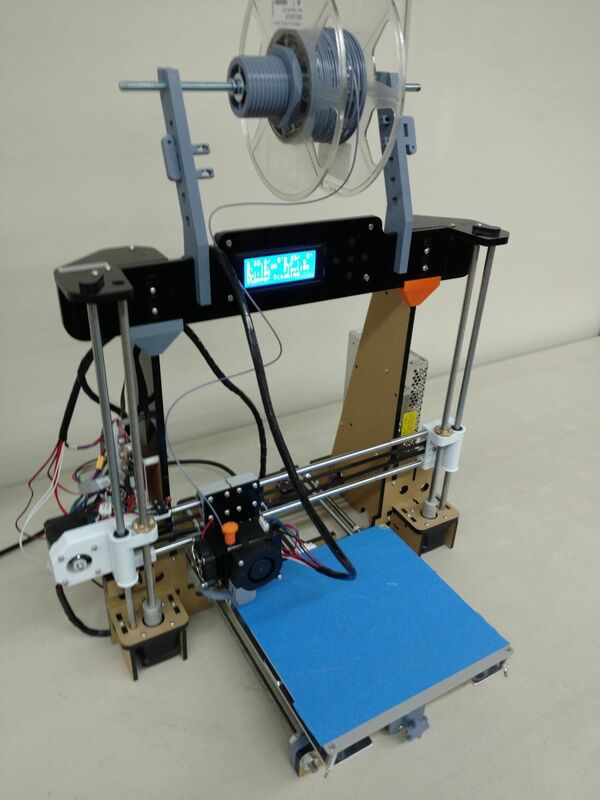 The Union City Lions purchased a 3D Printer for the Union City High School Science Olympiad Team. The printer is also used by tech classes and other students working on projects for their other classes. 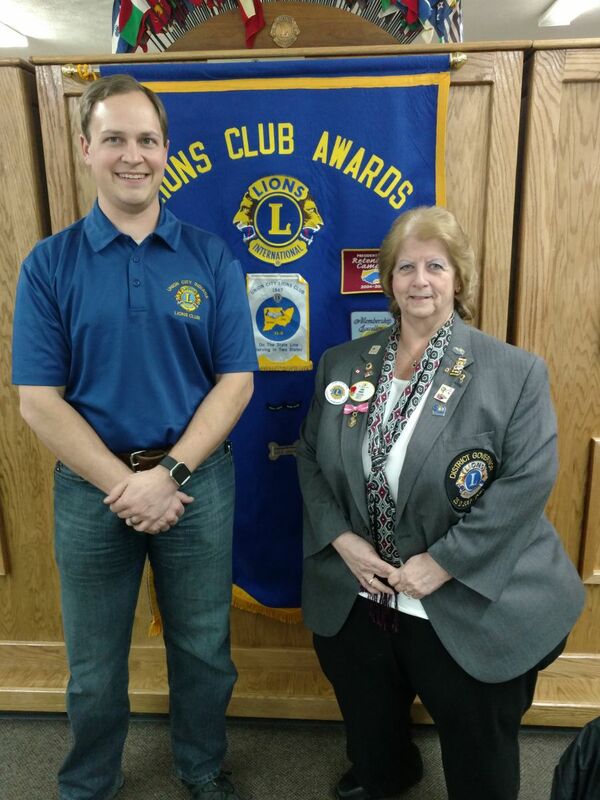 The Union City Lions met on Tuesday, April 24th, at the Union City Community Room. 25 members and one guest were present for the program brought to us by Stephen Price one of the members of All Brothers Lawn Squad. Stephen and his three brothers (Tim, Ben, and Dave) started the Lawn Care business in 2011 with 60 clients the first year. Their business has grown consistently to serve over 1400 clients. All Brother Lawn Squad offer many lawn care services including mowing, weed control, fertilizing, seeding snow removal and inside pest control. Their clients are spread over an area that includes Muncie to Versailles, OH, and Portland to Richmond. Stephen talked to the club about how All Brothers Lawn Squad got started and answered questions about lawn problems and lawn care. If you are interested in lawn services from All Brothers, check out their business online at www.lawn-squad.com. 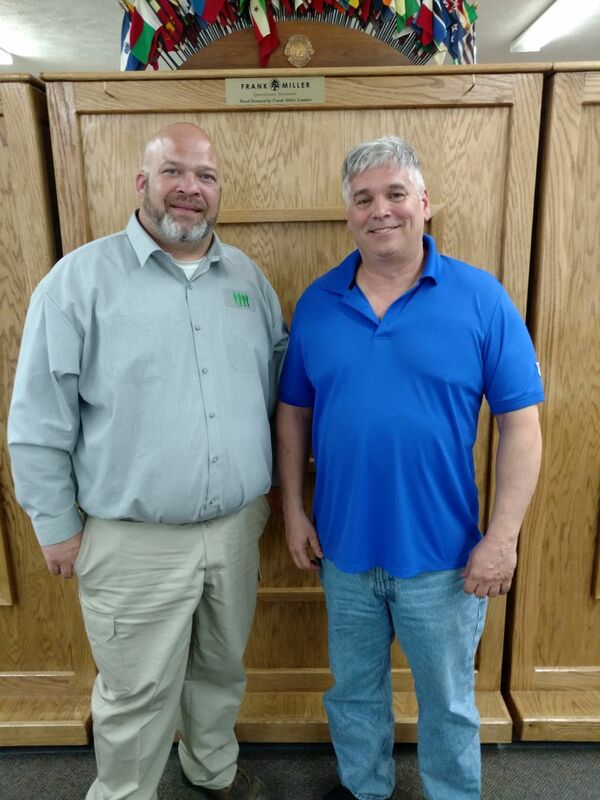 Pictured are Stephen Price, owner of All Brothers Lawn Squad, and Dan Green program chairman. 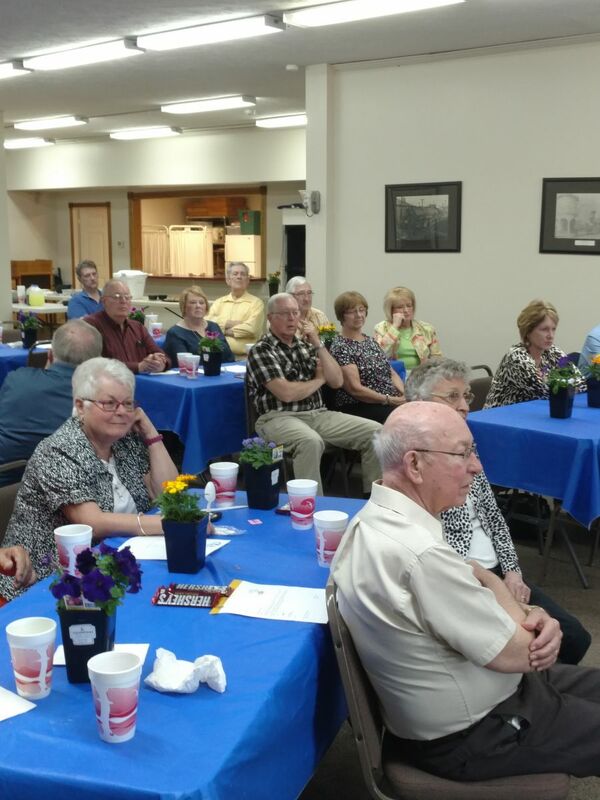 The Union City Lions Club met Tuesday evening for the first April meeting. We were treated to a wonderful meal prepared by Vicky Vinson and Allen Jefferis. Our special guests were District D Governor, Cindy Wright, and her husband Rick. Cindy and Rick are from the Upland, Indiana Lions Club. Cindy shared about the Lions International Convention held in Chicago. 33,000 Lions from all over the worlds attended the convention. There are 1.4 million Lions Club members worldwide who are all working toward the same goals. Cindy also shared that Lions International will continue to focus their efforts on sight preservation, but they will also start new projects to help diabetes, and childhood cancer. As our District Governor, Cindy is also involved in membership and Lions involvement in many helpful projects. 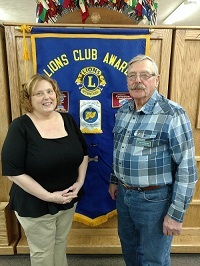 Cindy, we would like to say thank you for your dedication to the Lions clubs in our district. On Saturday, April 7th the UC Lions held the Spring Pancake Day. Almost 500 people came and enjoyed pancakes and whole hog sausage. The UC Lions would like to thank all who supported this and we look forward to our fall pancake day in November. 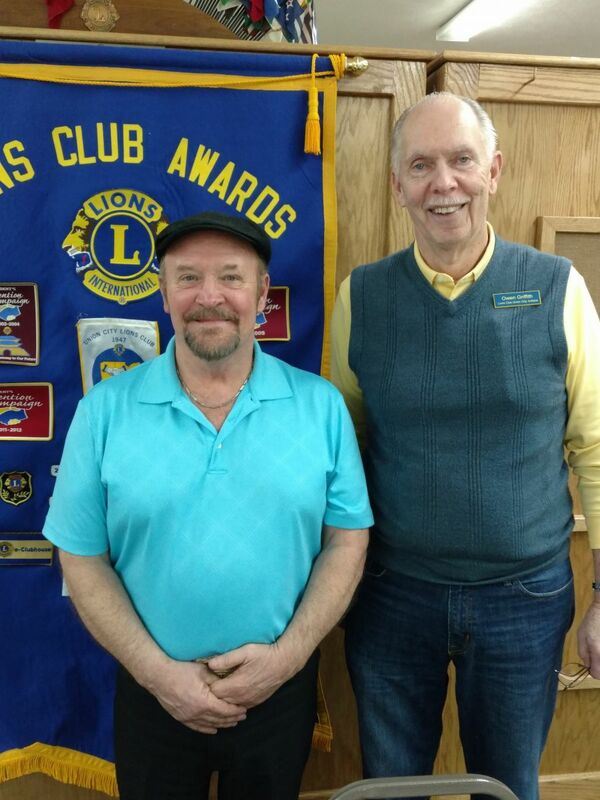 Pictured are Lion Ed Speight and 50/50 winner Frank Flech. At tonight's meeting, we were treated to a fantastic presentation from UCI Police Chief Cobie Wells and UCI Fire Chief Steve Shoemaker. The first item they informed us about was the holiday heroes program where children from our community are able to go Christmas shopping with a member of the police or fire department. The program started out with 10-15 kids and has now grown to help over 40 this past year. No child has ever been turned down and the program is funded by donations. Next, they presented to the Lions the evolution of what started as the Thin Blue Line Camp at Harter Park to what this year will be the Iron Sharpens Iron Camp at Chenoweth Trails in partnership with the Matt Light Foundation. This will be a free camp for up to 50 kids who will be going into 4th through 6th grade and is a team effort between the Police and Fire depts along with the school and area churches and it is focused on the 7 healthy habits for highly effective kids. Events will include archery, swimming, police fire and Careflight demonstrations and much more. 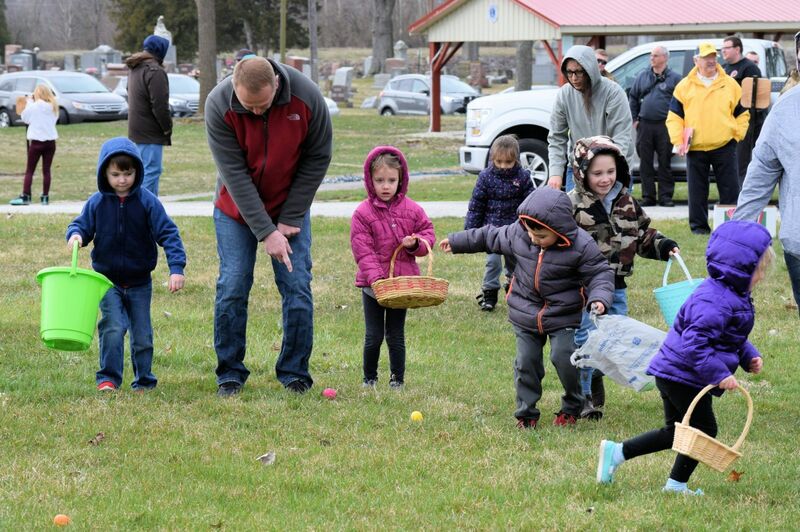 This is an amazing opportunity for kids in our community and we were all extremely impressed at the hard work and dedication everyone in both departments is putting into making Union City a better place to live and improving life for our children. 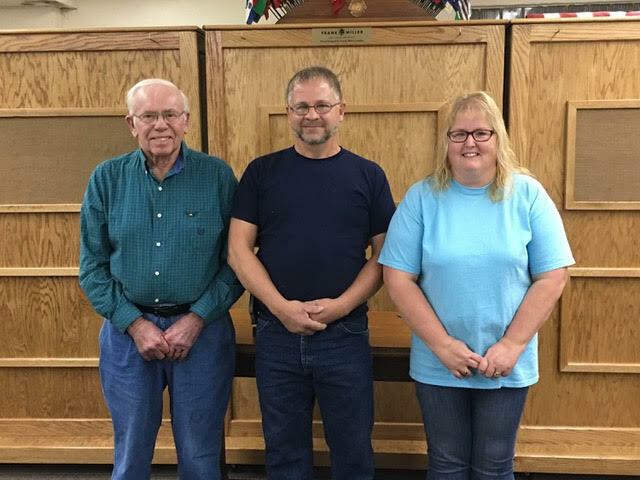 The Union City Lions Club got the month of March underway with a Blood Draw on March 5th and a regular meeting on Tuesday, March 13th. The first regular meeting of March started with a meal prepared by Vicky Vinson and Allen Jefferis. It featured a delicious pulled pork sandwich that was smoked by Lion Joe Wyant. (GREAT job Joe, it was spectacular!) The program for the evening was given by Lion President Blake Clevenger. Blake is one of the coaches of the Union City High School Science Olympiad Team. 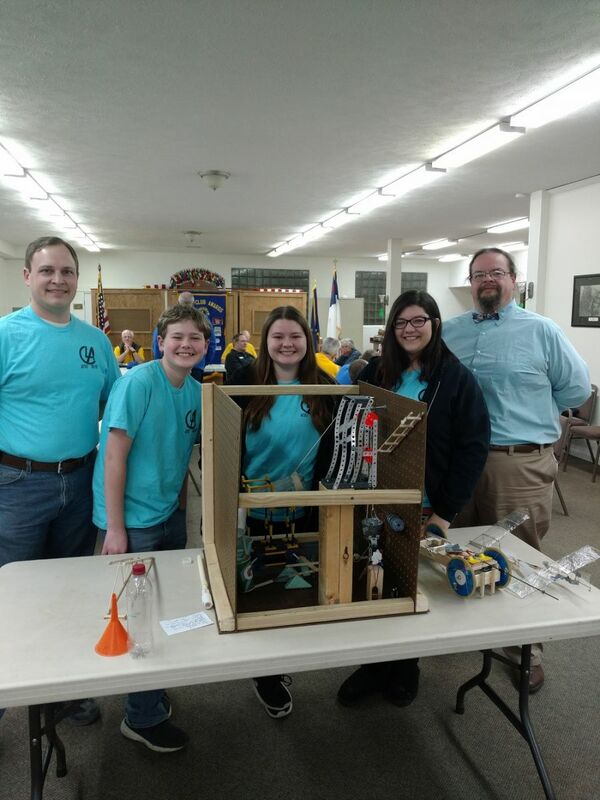 He had a few team members with him as they talked about their experience at Butler University in February and showed the Lions Club members some of the things they built for the competition. 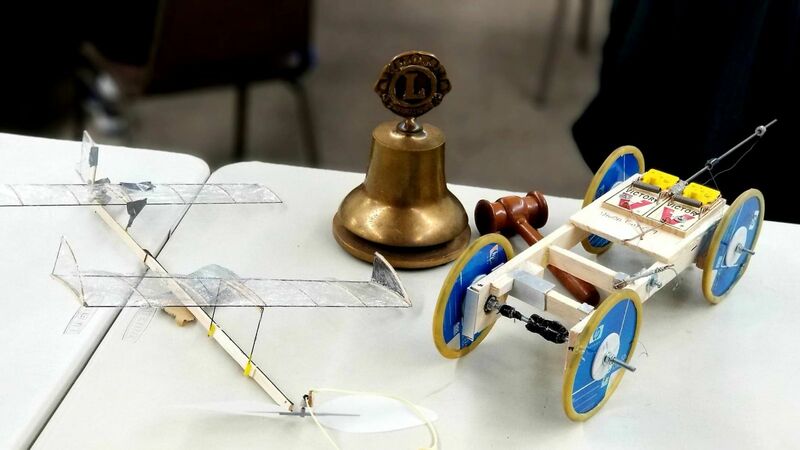 A Science Olympiad competition involves 23 events where students study a topic and take a test, build a device and test it at home then compete with it at the competition, or build a device at home and take it to the competition to use it in an event. The Union City team placed in two events at Butler. 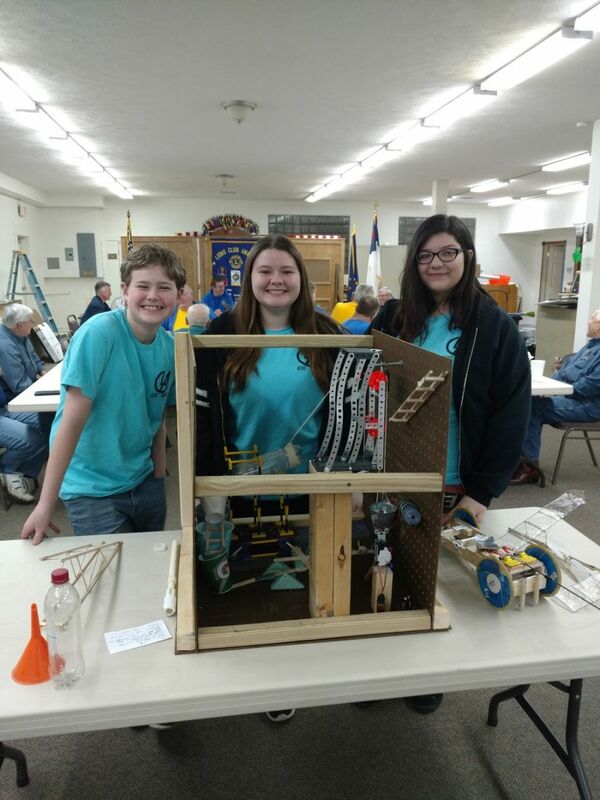 They placed 5th in Mission Possible (they had to build a Rube Goldberg device within certain parameters), and 5th in Mousetrap Car where they had to make a mousetrap powered car that went forward and then backward specific distances. Blake, assistant coach Kirk Schilling, and four of the 2018 team members gave a good presentation and answered questions for the club members. 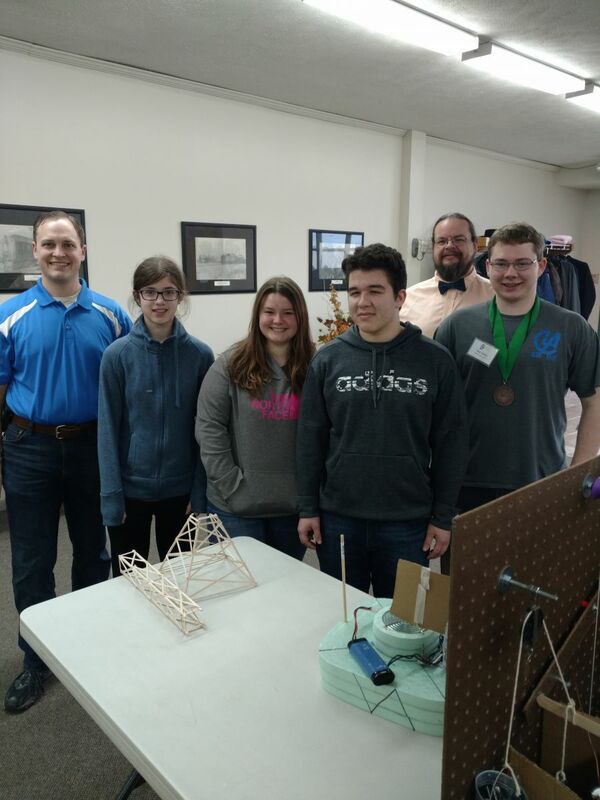 Pictured are Science Olympiad Coach Blake Clevenger, Christina Sowinski, Shelby King, Antonio Jasso, Assistance Coach Kirk Schilling, and Paul Bailey. Members not able to attend the meeting were, Sylairs Denney, Dylan McClure, Parker Kerns, Piter Sicolela da Silva, Keaton Collins, and Hunter Reagan. 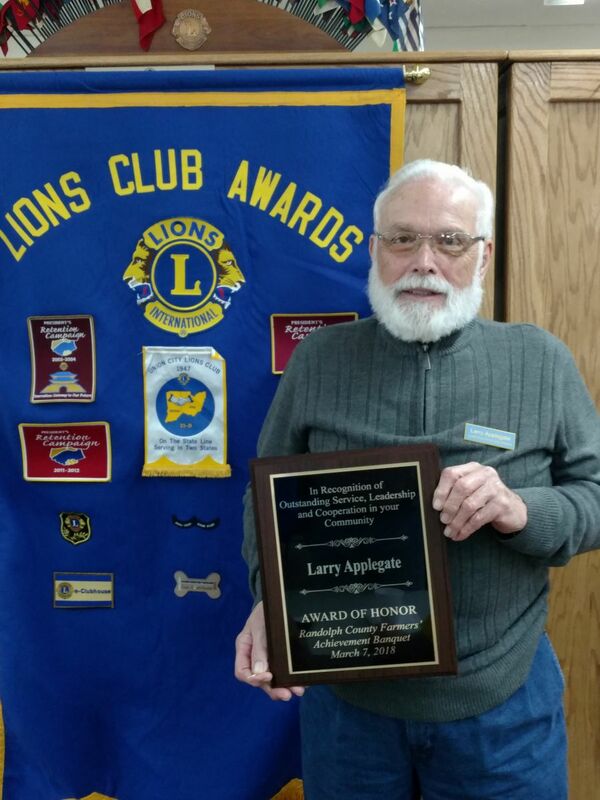 Congratulation to Union City Lion Larry Applegate. Larry received an Award of Honor from the Randolph County Farmers Achievement Banquet. 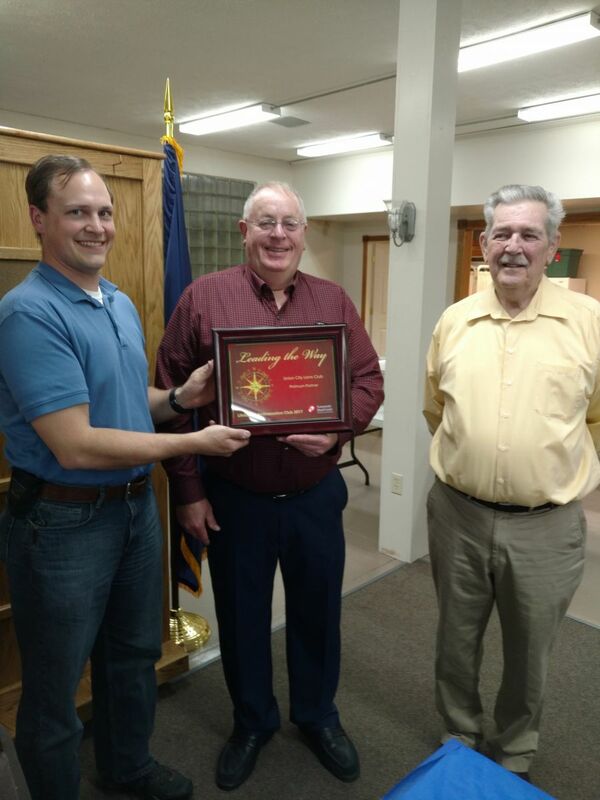 The plaque reads, "In Recognition of Outstanding Service, Leadership, and Cooperation In Your Community To Larry Applegate Award of Honor Randolph County Farmers Achievement Banquet, March 7, 2018"
The Union City Lions Club held its regular meeting on February 27th in the UC Community Room. The evening started with a delicious meal prepared and served by Vicky Vinson and Allen Jefferis. The program was presented by Teresa Hampshire, manager of the Union City Help Center. The help center was started in 1986 by two Union City churches, the 1st Christina Church and the Trinity Lutheran Church. The help center has a large selection of clothing for sale to the public. There are also dishes, pots and pans, bedding, jewelry, books, and many other household items for sale. There is also a food pantry that assists individuals in providing food for their family. The UC Help Center counts on donations to keep their store full of items to help the people in Union City. They also help fire victims and people in homeless situations. Every year at Christmas time the help center makes Christmas Baskets to help families to prepare a Christmas meal. This past Christmas the help center put together 130 baskets for people in Union City. Thank you to the staff and many volunteers that make this business a vital part of our community. The Union City Help Center is always in need of volunteer help. If you are interested in volunteering please call 765-964-4475. The Union City Lions Club held its 1st meeting for the month of February on Tuesday the 13th at the Community Room in Union City. The evening started with a meal prepared by Vicky Vinson and Allen Jefferis. The program for the evening was presented by Jane Bloom and Beverly Chenoweth from the New Lisbon Christian Church. The ladies told us about a mentoring program their church is involved in. Kids Hope USA is a national program that matches adult mentors with elementary age students. Each mentor promises one hour/week to meet with an elementary student. They spend the hour talking, working, and playing games. 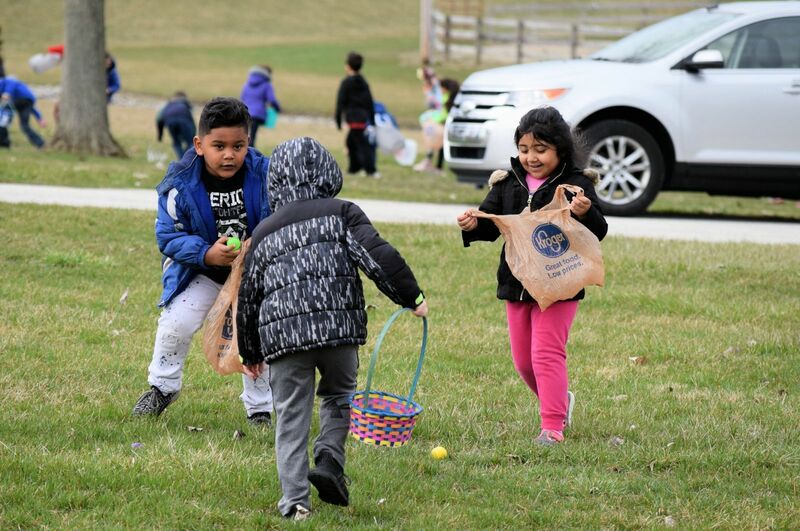 New Lisbon Christian Church started their association with this program a few years ago and has between 12 and 22 mentors each year that meet with North Side Elementary students here in Union City. The initial cost of joining the program was a donation from an individual here in Randolph County. Jane and Bev both expressed that the benefit for the kids is great and the return for the mentors is also good. Mentors must be from the New Lisbon Church, but the church is open to partnering with another church to expand the program for North Side. The Union City Lions Club held its second meeting of 2018 on Tuesday, January 23rd. The meeting started with a delicious meal prepared by Vicky Vinson and Allen Jefferis. Our guest was the manager of the Randolph County Airport, Mr. Eric Livingston. Eric answered questions about the Randolph County Airport Fly-In Breakfast in June. The Fly-In Breakfast is well known and has been a yearly event for 68 years, one of the oldest fly-in breakfasts around. The Union City Lions have decided to partner with the airport to help cook and serve breakfast. This year's Fly-In Breakfast will be held on Saturday, June 9th and the menu will include sausage, eggs, toast, coffee, and juice. The event is open to the public and will offer airplane rides and a chance to see many types of airplanes. 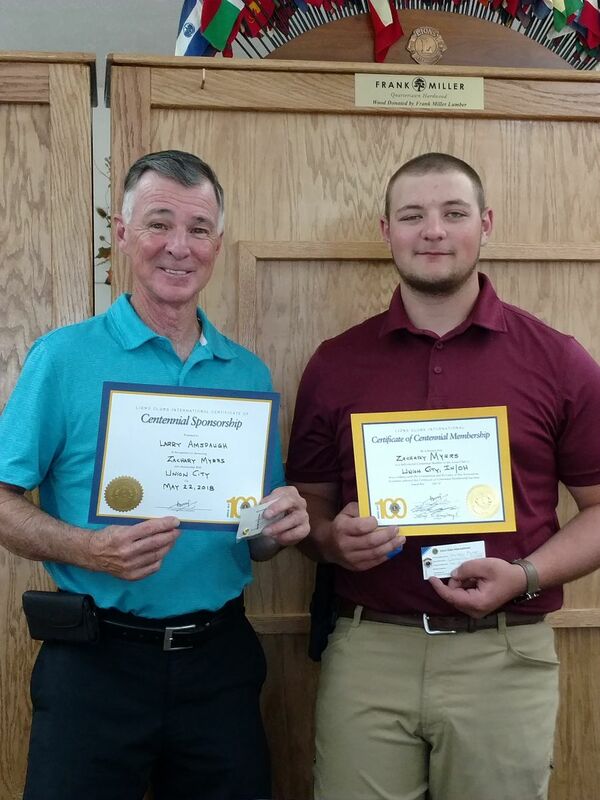 Pictured are Randolph County Airport Manager, Eric Livingston and Union City Lion Secretary, Owen Griffith. 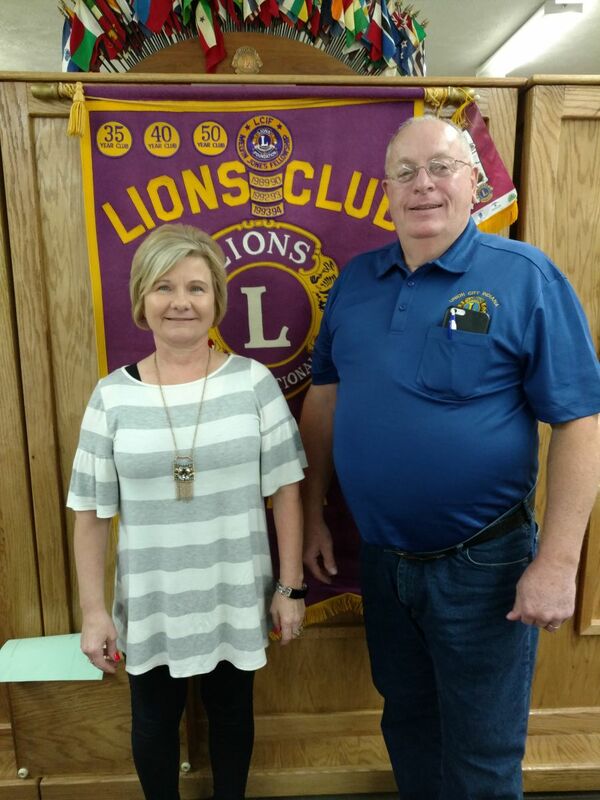 The Union City Lions Club met for the first time in 2018. Our January 9th meeting was held at the Union City Community Room and started with a beef stew meal prepared by Vicky Vinson and Allen Jefferis. The program for the evening was presented by Mr. Fred Elliott, a teacher at Union City Jr/Sr High School. Fred has started an archery team at school and explained to the club how it got started, how many students are involved, and what the needs of the team are. The team competes in competitions affiliated with the National Archery in Schools Program. They compete at schools in our area a few times through the winter. They also participate in a competition that can qualify the team or individuals for the state tournament. Fred brought three of the team members who also spoke about their experiences with the team. The three members who helped with the presentation were Katie Reichard, Ian Glunt, and Katie Elliott. The group was started with grant money and they are in need of more equipment to continue with the 16 students they have at this time and to continue to grow the program. Thanks to this group for a great program. Pictured are Union City Jr/Sr High School Archery Team Members Katie Elliott, Katie Reichard, Ian Glunt, and team Coach Fred Elliott. On Tuesday, Dec. 12, 2017, the Union City Lions Club celebrated Christmas with their winter Ladies Night. 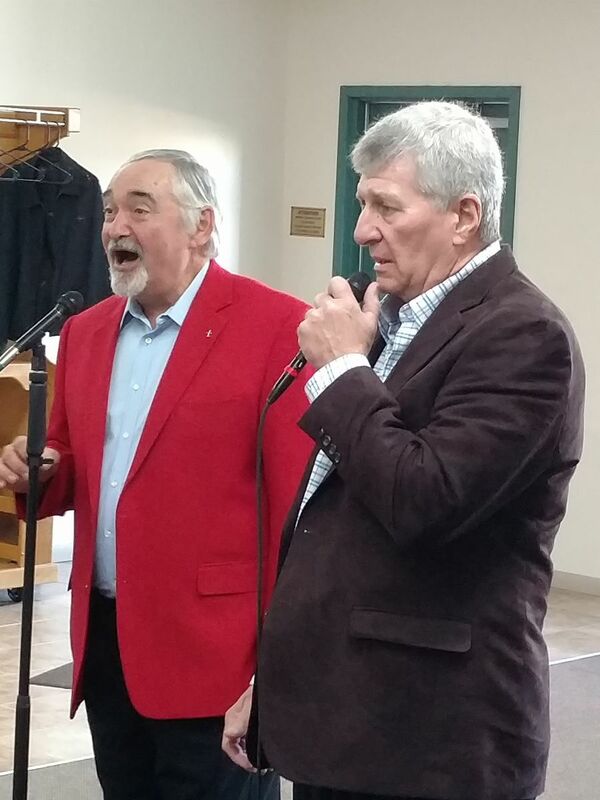 The Lion's members and their guests enjoyed an evening that included a delicious meal prepared by Vicky Vinson and Allen Jefferis, and entertainment provided by the Unioin City Jr/Sr High School Chorus under the direction of Fred Elliott. The High School Chorus sang a few Christmas songs and then the Jr High Chorus took their turn with some selections appropriate for the season. Both groups then combined for a song. The students did a wonderful job and the music was enjoyed by all. The next Union City Lions Club meeting will be on Jan 9, 2018. The Union City Lions Club held its second meeting in November on Tuesday evening the 28th. A delicious meal was served by Vicky Vinson and Allen Jefferis. The program for the evening was presented by Chris Shaneyfelt. Chris oversees the Randolph County Emergency Management Office and the Randolph County 911 Call Center. The 911 Call Center employs 13 people and is the communication center for all emergency calls in Randolph County. Chris shared that the average time for a 911 call is about 90 seconds from call to dispatch. The Office of Emergency Management deals with disasters, tracks hazardous materials, and works with weather-related events. Chris also talked about winter preparedness and the county's travel level status plan. Chris shared that the county is working to become a Weather-Ready County. Anyone interested in getting weather warnings as they happen should have an app called 'Code Red' on their device. You can follow the Randolph County Office of Emergency Management on Facebook and Twitter for more information. The Union City Lions Club held its first regular meeting of November on Tuesday, November 14th. The members present enjoyed a meal prepared by Vicky Vinson and Allan Jefferis. The program for the evening was presented by Ted Martin from Winchester. Ted brought his extensive collection of Indian Artifacts and talked about how they were made, what they were used for, and where he found some of them. The artifacts were either found by him, purchased by him, or traded for. Ted's collection includes many arrowheads, spearheads, knives, knife blades, and tools. Ted also told us how to tell a real artifact from a recently made fake. The Union City Lions were happy to welcome Ted, a member of the Winchester Lions Club to our meeting. Thank you for a very interesting and informative program. David Lenkensdofer and Ted Martin. Congratulations to Union City Lion Ed Raszkowski. 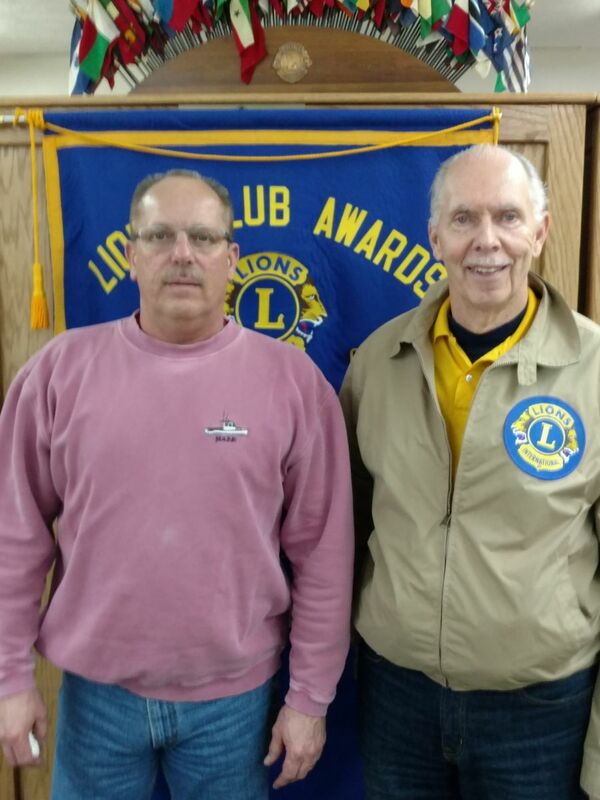 Lion Ed received a Lions Centennial Pin for bringing in a new member during the Lion Centennial Year Celebration. Ed is the Union City Lions Club's Membership Chairman. Pin to Union City Lion, Ed Raszkowski. 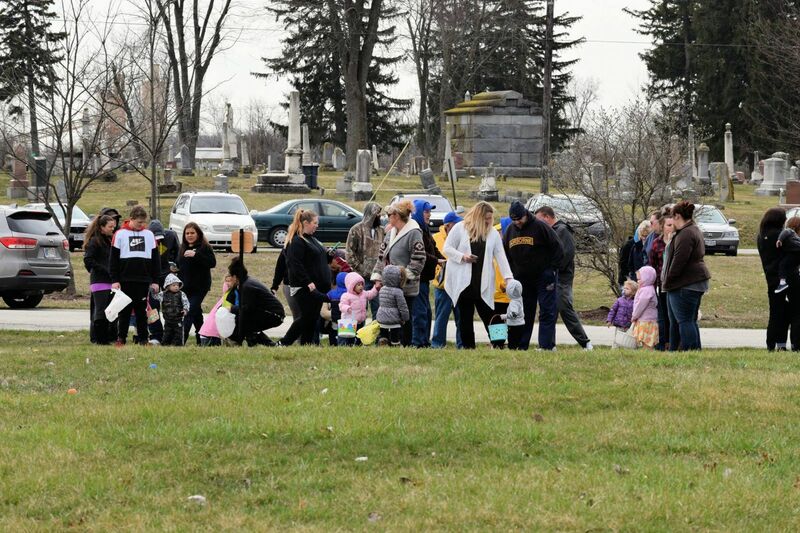 More Halloween Parade pictures on this site and on Facebook. 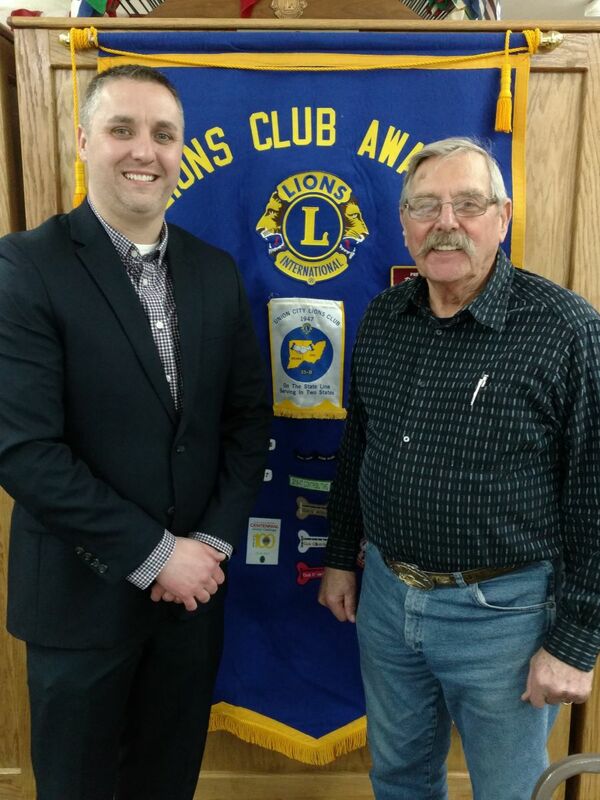 The Union City Lions Club heard from the Union City HS Boys Basketball Coach, Bruce Davison. Coach Davison will be in his 1st season as the head coach of the Indians and he spoke about the upcoming season and some of his philosophy of coaching. The team graduated about half of the offensive production from last year but has some starters back to build around for the 2017-18 season. Coach Davison knows that coaches often have a big influence on their players, and hopes to not only teach his players basketball but also life skills beyond the game. He believes that "disciplined people succeed" and feels self-control and accountability are important skills for his players to possess. The evening started, as usual, with a delicious meal served by Vicky Vinson and Allen Jefferis. Union City HS grad, Brian Merrill, is the new Director of KISS TV at Union City HS. 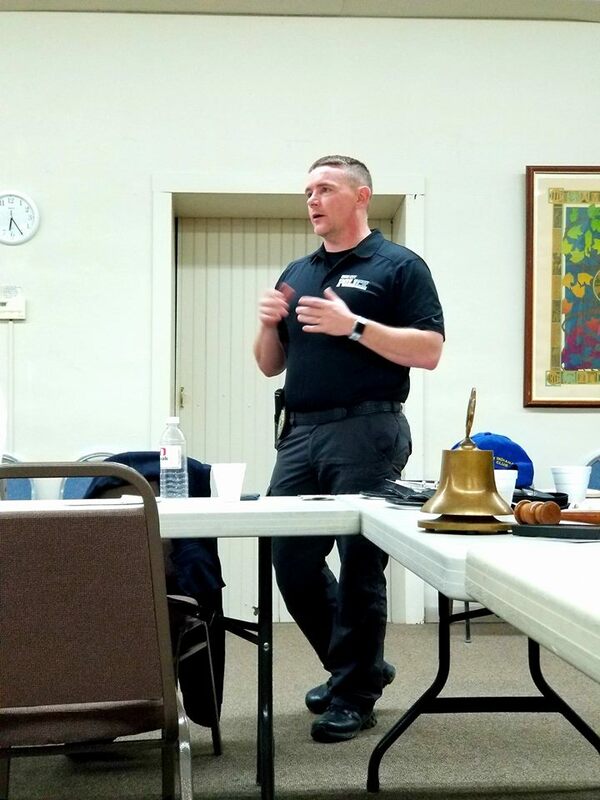 Brian spoke to the Union CIty Lions at the Oct. 10 meeting and discussed his plans to revive the KISS TV student-run station along with his ideas which include internet broadcasting, local programs, sporting events, and other community activities. Brian brings a wealth of experience to UCHS including radio announcing, high school teaching, marketing, and Television Production. 23 Lions were in attendance and were provided a great meal served by Vicky Vinson and Allen Jefferis. President of the UC Lions is Blake Clevenger. Anyone interested in becoming a UC Lion can contact any member. Our Motto is "WE SERVE". Mr. Brian Merrill. Director of KISS TV at Union City Jr/SrHigh School. 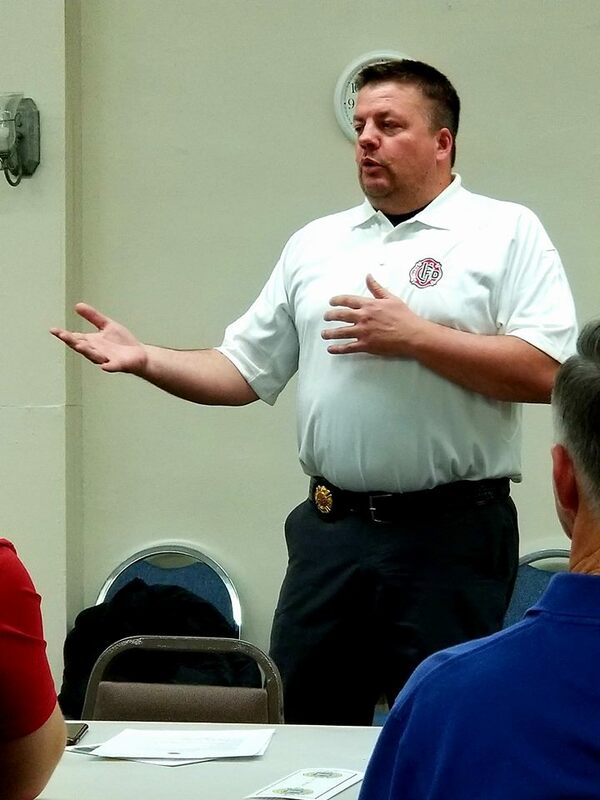 The Union City Lions met on September 26, 2017, at the Union City Community Room. 23 Lions and two guests enjoyed the beef stew meal and the program presented by Scottie Harvey, Randolph County Convention and Tourism Bureau Director. Scottie updated the club on some events that are coming up in the next year. 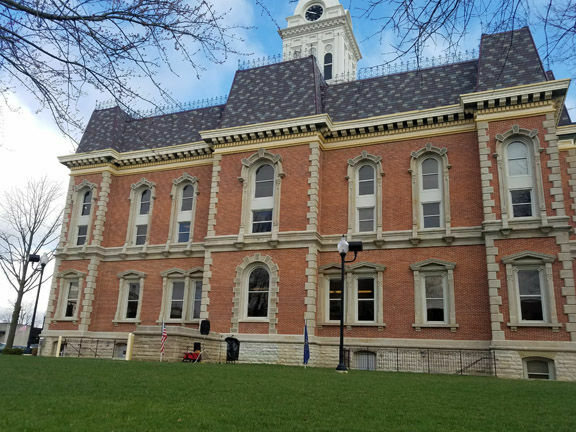 Both Randolph County, and the city of Winchester, will be celebrating their 200th birthday in 2018. They have events planned every month but there are three BIG events. On Jan. 6 there will be a Gala at the Community Center in Winchester. May 19th brings an Ice Cream Social and a Birthday Party. And on August 18th and 19th There will be activities at Goodrich Park in Winchester. Scottie also talked about the Randolph County Events Calendar for 2018. She is looking for old pictures from around Randolph County. Pictured are UC Lions President, Blake Clevenger, Randolph County Tourism Director, Scottie Harvey, and Lions Program Chairman Tim Green. The Union City Lions Club had the 1st meeting of our new year on Tuesday, Sept. 12th. The 23 members and two guests enjoyed the meal prepared by Vicky Vinson and Allen Jefferis. The program for the evening was Union City Lady Indians Basketball Coach Sarah Black. Coach Back talked about the Lady Indians run through the 2017 State Basketball Tournament last Spring. The season culminated at Banker's LIfe Fieldhouse and a state championship game against Wood Memorial. Union City became the 1st girls basketball team from Randolph County to play for a state title. Even though the Lady Indians came up short during that game, the school and the community are very proud of their accomplishments. Congratulations to The Union City Lady Indians for a great 2016-17 season. Eleven Lions were recognized for having perfect attendance for the 2016-17 Lions year.